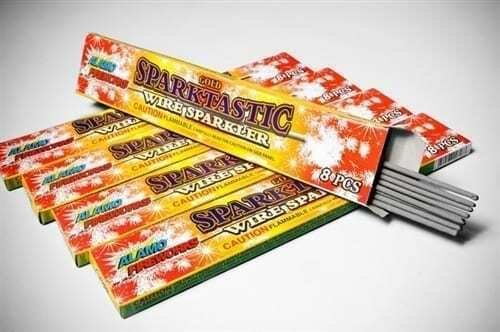 These sparklers are fantastic quality and can fit into any budget. You can share handfuls of lovely 10 inch sparklers with friends and family for Diwali. 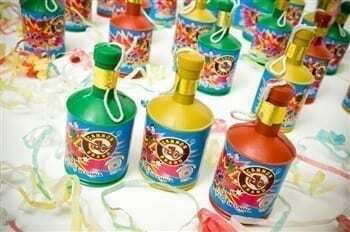 They are very easy to light and pass around to your party guests. Our sparklers are a wonderful addition to your Festival of Lights! 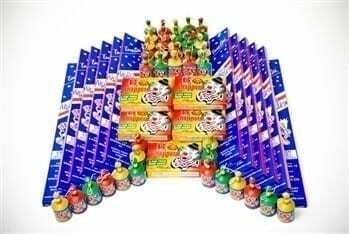 Best Value Sparklers for Your Diwali Celebration! A Fun Favor! These sparklers are Sparktastic! These lovely 10 Inch Gold Diwali Sparklers are the same high quality sparklers as our #10 Gold Party Sparklers. One order includes 192 wire sparklers (2 dozen boxes, each box holds 8). 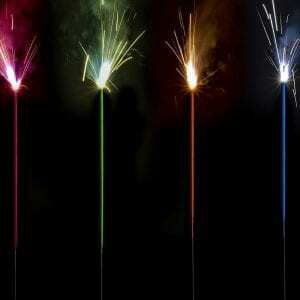 The burn time for each wire sparkler is 35-45 seconds. Our #10 Gold Diwali Sparklers are made out of wire, not bamboo, and will not produce large amounts of smoke nor ash off, making them safer to use. How Many for Each Guest? We recommend purchasing at least 4 sparklers as a favor for each guest. Your friends and family will enjoy passing the “spark” from person to person. 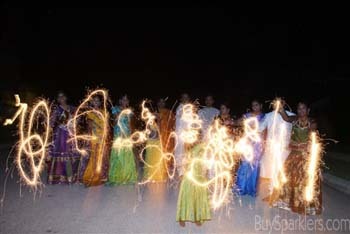 Sparklers are a wonderful alternative to fireworks at your Diwali event. Our #10 Gold Diwali Sparklers produce a beautiful shower of shiny gold lights that flicker back and forth in the air. They bring warmth, excitement and energy to any event. Friendly Reminder: Sparklers are recommended for outside use only. Hold the sparkler at arm’s length when burning and for safety reasons give yourself plenty of room when burning sparklers. Adults should supervise children, not recommended for children under age 8. Be sure to have a bucket with sand or water nearby to dispose of hot sparklers to prevent burns or injuries. A Significant Indian Festival: In India, Diwali is Hindu festival celebrated by millions by going to firework displays, saying prayers, sharing sweets and enjoying events every autumn. As Hindu followers move around the world, this exciting event is now celebrated in new communities including numerous cities throughout the United States. 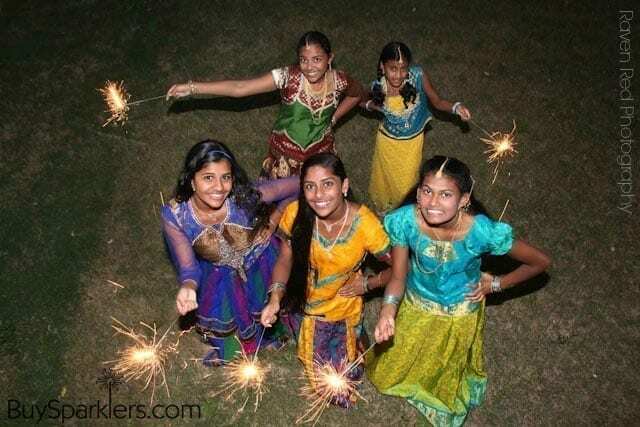 While fireworks are still traditionally associated with New Year’s Eve and 4th of July in the USA, Diwali is quickly becoming more popular and sparklers are often used in temple and backyard celebrations. Make your Festival of Lights celebration enchanted by lighting sparklers as you welcome this joyous holiday season! 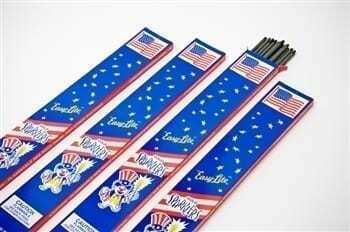 We have been using the 10 inch sparklers for many years and always order from this lovely company! I appreciate the rapid shipment of my order and look forward to talking with Nicole every year. She is so friendly and helpful! LOVED the sparklers! They were beautiful!